Like the title says, these are the final words of Elder Theodosis. I feel so weird writing this knowing that in 3-4 days I will be back to civilian life in Texas, but I am looking forward to it so you don’t need to worry about me not being ecstatic because I am. I haven’t showed it as much though because I feel like other missionaries would shun me for doing so! We moved into this really awesome house today because the lease was up in the other one so I will be in a new place for about two days before I have to move out again, but oh well, haha. The place we are in is sweet! They have autographed jerseys all over the place of legends like Michael Jordan, John Elway, Karl Malone, Shaq, and etc. I will have to show you later. Well I will see y’all in 3-4 days! Please don’t have a girl there waiting for me, I’m not ready to start dating yet Thank You! Talofa O-A-Mai-Oe Palanis! (If you forgot what this random saying that I continue to use is, it means hello, how are you white people). Sorry, I thought that I would bring that up because I don’t know if you remember little things like that haha! This past week went well minus the fact that I found out that I got an ear infection in my left ear (swimmers ear, but I have not been swimming I promise) ! It is starting to get better, and I have actually been using ear drops to help out with it to, so it is all good! Time has been flying by like crazy now, and the members aren’t helping one bit. I think one thing that you do learn here while serving is to ask better questions of the missionaries in your area. 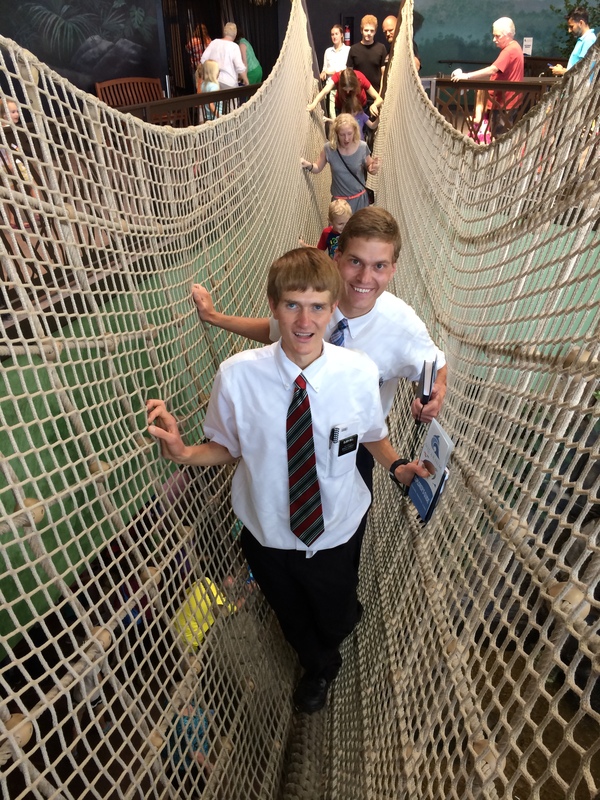 The top three questions that you get from serving a mission in Utah are: 1. How long have you been out, 2. Where are you from (nothing wrong with that), 3. How much time do you have left – probably the worst question to ask someone who is getting ready to lay the hammer down in their area before they have to go home). I have honestly gotten more frustrated with questions #1 & #3 than I have the 2nd one. I know the members aren’t looking to create anything bad, and that they are all either curious or excited for the missionaries, but I hope that I don’t ask those questions a whole lot after my mission to the missionaries because it has made it a little more difficult for me to focus; no doubt missionaries around the world have the same issue with that question too. Antwon, the kid we are teaching is getting baptized this Saturday! Elder Bell & I are extremely excited about it too! Antwon will shortly after be adopted by the family, and then sealed to them. They invited us to go to the sealing with them, but we have to figure things out first before we know whether or not we can go. I personally think that would be an awesome way to end a mission because you don’t hear about it happening that often anymore. If we were to go it would be on the 26th of this month. to tell you the truth, don’t really care who all comes to the airport to see me. I say whoever would love to greet me at the airport can go, family are welcome to go if time allows them to be there, but if not, then I would be happy to see y’all later that day! I’m not trying to sound frustrated, it is just that I am trying to not think too much about all that right now. Thank goodness I still have 2 weeks left to do all this! I love y’all, and miss y’all, but I know that I can’t skip right to the finish line yet. It will have to be after I get off the plane in Houston. I honestly didn’t think I would ever be sounding like this, but it’s a good thing right? I sure hope so because I have been able to see the difference that it has made in other people since I have been here and it is awesome! Actually after we finish emailing we are going to go to the aquarium with some investigators today so it will be a blast! I will try and take LOTS of pictures for next week along with the baptism photos too. Take care everyone! I love, and miss y’all! I have loved all the gifts and everything that everyone has been sending me! 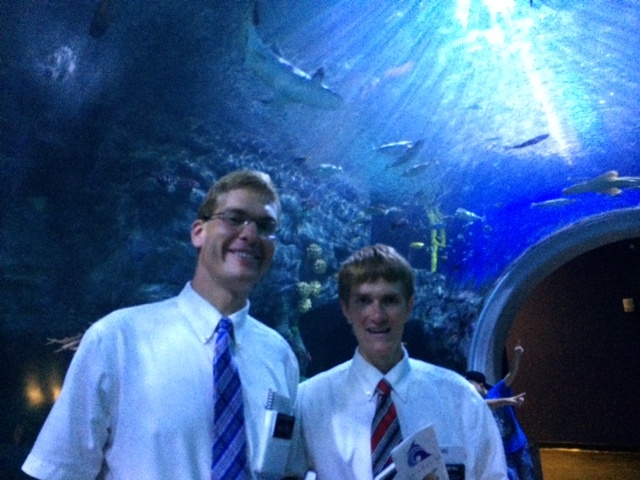 It has been awesome, and Elder Bell/ I have thoroughly enjoyed it! This past week we were able to bounce back a good bit in Drape Town, and find more joy & smiles instead of frustration & stress! It was great! We currently are working with 1-2 people, and helping them work towards baptism on the 16th of August so that should be great! That was awesome to hear about Cindy’s job raise! That is sweet! I knew I came from a hard working family, but that proves the case even more haha. Congratulations Cindy on the accomplishment, and don’t stop there! There were a whole lot of people that we talked to this past week, and we handed out a ton of pass along cards too! I remember when I was super apprehensive about talking to people, but it is actually a whole lot more enjoyable now. All you have to do to have fun with it, is to look for clues when you talk to them, and get to know them personally. Elder Bell knows a little bit of Espanol, and I know enough to say “I know little Spanish” so we were able to communicate to some people by doing that , and it’s fun. I don’t have to worry about looking stupid because I am preaching the gospel while doing it. I have officially gotten to the point where I am actually going to start phrasing how long I have been out differently. Reason why is because whenever members ask us how long we have been out I would say 22 months. It is the truth, but I’m starting to cringe more whenever I hear it because people are always like “oh, you’re done!” or “It’s smooth sailing from here”, and I hate it. I didn’t like the question when I was first out because I was thinking this was going to last forever, but now I don’t like it because I know that I am not done, and that I’m not finished until I get off the plane in Houston. I’m going to start saying “more than a year” now because it sounds a whole lot more comfortable, and it makes it sound like I have tons of time left! I have seen myself change a whole lot since I have been out; I have actually been able to come to understand myself more throughout the growth process since I have been out here, and I love it! I can now boldly say that I know that Jesus Christ is our savior, that the Book of Mormon is true, and that this gospel is true! To be completely honest with you, I don’t think I could have told you all that two years ago — in fact I know that I wouldn’t be able to but I can now. Elder Bell has gotten a little bit better from the last time we emailed you, and he is eating a whole lot more now which is great. I have learned a whole lot of healthy eating habits from him, and I actually love grilling vegetables now! They taste so good, and I have been using a ton of olive oil with them too! We still enjoy walking everywhere because although we have a huge amount of ground to cover we are able to talk to so many more people than if we were in a car. Elder Bell like me loved to workout a whole lot before the mission, but he would do a whole lot of running. I personally don’t like to run unless I am doing something while I run so we do workouts at our house every morning at 6:30 am. Elder Bell does 15 minutes of lifting weights as prescribed by a member nutritionist, and then does 10-15 minutes of cardio. He would actually originally have done cardio the entire time, but since his weight is so low he has had to mix it up because he doesn’t have anything left to lose on him. I on the other hand have gotten to the point where I do stretches for the first little bit and then afterwards lift weights on a bench press set that we have so it is pretty nice! It doesn’t even feel like I am coming home in a month, but I am pretty excited. I have a whole lot more I need to finish up here before I can think about that though. Wish me luck in my last month on the mission! I love and miss all of y’all, and hope that y’all continue to stay safe! This past week was definitely a trial-filled week, but there were some positives to it. Elder Bell & I ended up staying together for this next transfer so I will be dying (in mission terms) in Draper. Only 3 areas, hahaha. Elder Bell had his colonoscopy Thursday and they found some things that I won’t go into full detail about because I will either gross you out, or not get it right. After all of that was done we met back up, and some member took us both to Astro Burgers. I didn’t order anything, but the members let me get a drink so I got a Powerade. The members that took us “force fed” Elder Bell and told him that he would either need to eat the bread that came with his meal or he needed to drink all of the milkshake that the members got for him. He chose the shake, but asked while drinking it if he needed to eat the entire thing. The member responded by cussing at him, and telling him to drink the D*#$ shake! He downed the entire thing after they said that to him. We both found it funny afterwards so it’s all good! 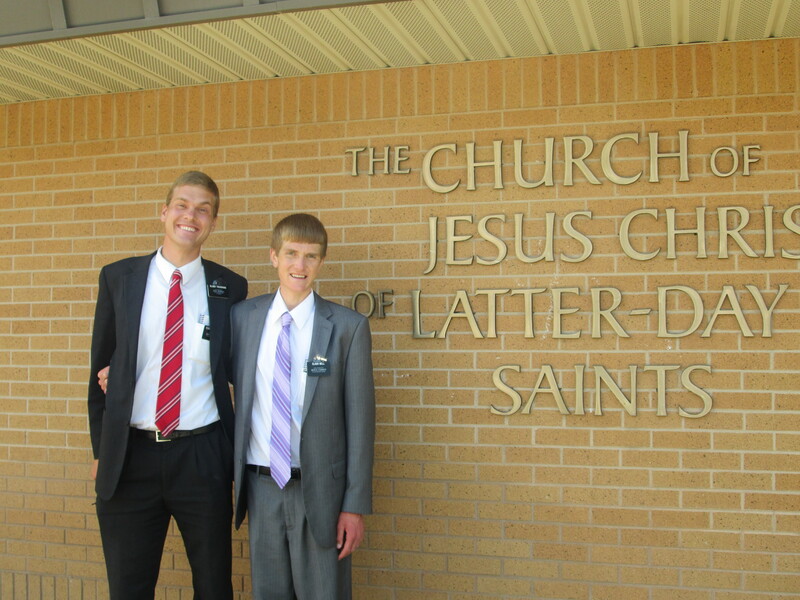 Elder Bell has lost so much weight and he is now down to 122. I don’t think I ever told you how tall he is, but he is 6’1. Not a small kid. He is “so healthy” that he has a habit where he looks at the nutrition label for everything that he eats, and he doesn’t eat fats at all. Right now we are trying to help him get into a habit where he won’t have a problem with eating them, and that is part of the reason why I gave him all my McDonald’s gift cards. He is literally almost all bones, but he has a little bit of skin left. I have had to learn a whole lot about patience with a little dose of faith/charity since I have been with him, but I honestly don’t know if it is actually going anywhere because it seems like things have started to get more difficult. The reason why I am freaking out so much is because I’m stressing about getting everything all done that I need to in this transfer before I finish. I can’t afford to waste any more time, but at the same time I need to help Elder Bell keep up. This probably looks, and sounds like a complaint email, but I honestly don’t know what else to say because I have been completely buried under negative things this past week. A couple of positive things though that have happened this week is that we put Antwon on date for August 16th, and we picked up a new investigator too. We had to hand off Alexa (12 year old) & Kaylie (10 year old) to the ward so that the ward can fellowship them until they are ready to be taught again, but there will be others that pop up that we can start teaching because anything is possible if you trust in God. We had this thing happen in our area this past week called Draper Days, and it was a gigantic festival with tons of things. Although I had never been before, it made me think about Austin City Limits because there were also people that came from California to perform. It was a whole lot of fun because we got to go to it and talk to a ton of people too. There were fireworks afterwards, but we didn’t get to stay for that, but we did hear them all from our house. I hope that all of y’all continue to do well and stay safe!